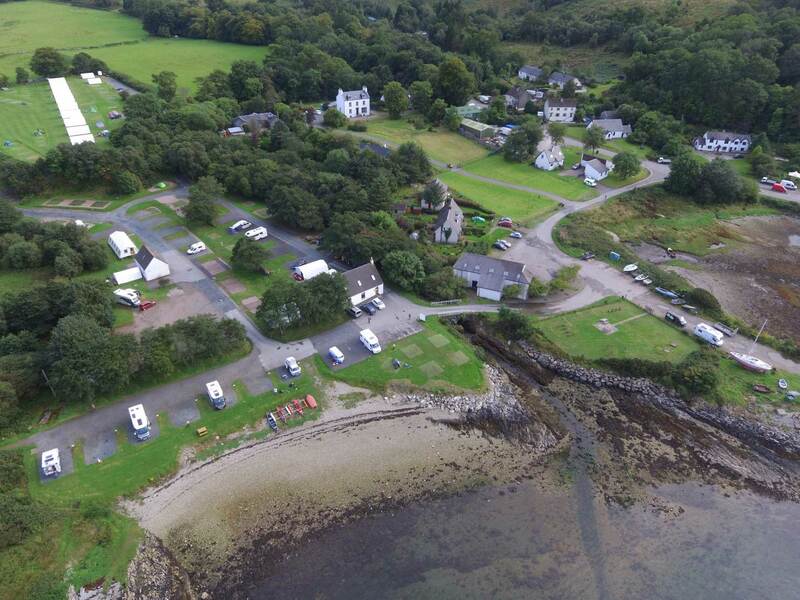 A beautiful shore front, family friendly campsite, with views up Loch Linnhe to Ben Nevis, and a warm welcome for you and your caravan, camper or tent. Dogs welcome on site and can be walked freely along the enchanting coastline, or local forestry walks. We are ideally situated for strolling to the ferry, pub, shop, hotel, local cafes, as well as buses for Tobermory and Fionnphort, where you can catch a ferry to the isle of Iona (or boat trips to Staffa). Craignure is the ideal base for touring the whole of Mull. On the lower park you will find reception, the main facilities, and pitches for caravans, campers, trailers and tents, with cars alongside where space permits. In the glorious top field, are the Shielings and most of the tent pitches with breath-taking views. All the camper/caravan pitches are at sea level, convenient to the main facilities, and all have hardstanding and optional hook-up. Astroturf pitches are provided to keep you and your tent warm and free of mud, just like a fitted carpet. We will lend you a mallet and heavy duty pegs if you need them. No more bare patches in the grass. Please also note that our outsized tent pitches are limited and only available on the top field and don't all offer hook-up. We will not guarantee specific pitches, as pitches may require reallocation for logistical reasons. Final allocations will be made on day of arrival and we will try our utmost to pitch you to your preferred spot when possible.